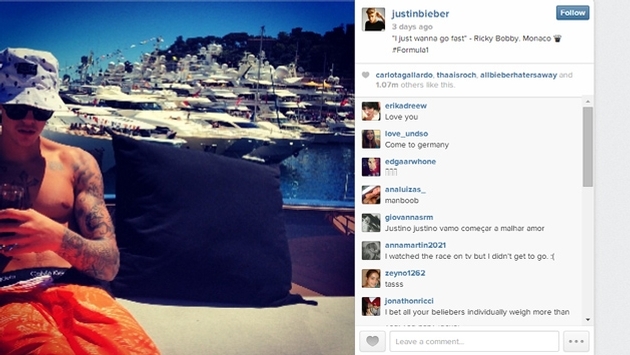 Justin Bieber was spotted relaxing — shirtless — on Sir Philip Green’s yacht in Monaco on Saturday, May 24. Justin looked more ripped than ever as he took a break from the Monaco Grand Prix, kicking back and allegedly drinking a beer. The "Baby" singer was also spotted canoodling with Cody Simpson's ex Gigi Hadid, Gossip Center reports. Sir Philip Green’s yacht is known as the “cheapest free hotel in Monaco” and has hosted other celebrity couples like Kate Moss and Jamie Hince. Last week, Justin, who showed off his toned torso while wearing a pair of orange Calvin Klein shorts, was spotted at the 67th Cannes International Film Festival with Gigi including the high-profile amfAR Cinema Against AIDS Gala. Could they be Hollywood's next "it" couple? What do you think? Either way, relaxing on a yacht is a perfect way to enjoy the sun and warm weather. Do you agree? Tell us in the comments section!